(London, England) – Beavertown Brewery is a Cask customer and a leader in the UK’s growing micro-canning segment. In just over a year, the brewery has won rapid success and acclaim with flavorful beers canned on a Cask ACS machine. The brewery’s latest award goes to Jenn Merrick, Beavertown’s head brewer. 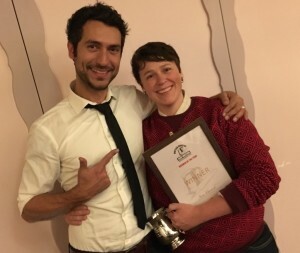 On December 3 she won the British Guild of Beer Writer’s “Brewer of the Year” award at the Guild’s annual awards dinner in London’s Park Lane Hotel. The award provides another big dose of credibility for Beavertown and micro-canning brewers in the United Kingdom. The Society of Independent Brewers (SIBA) represents British craft brewers. SIBA managing director Mike Benner cites Beavertown as proof of Britain’s increasingly innovative beer culture. Their beers,” Benner says, “are the epitome of the quality, flavor and innovation that is making British beer so exciting right now. Jenn has a way of injecting bags of flavor into her beers while maintaining an unrivalled drinkability — something which has helped Beavertown grow in popularity with beer drinkers and beer writers alike. For photos, interviews and more details on Cask’s gear and history contact Marty Jones at 00-1-720-289-9345 (cell) or marty@martyjones.com.